Donuts can be such a hedonistic pleasure, especially when they are made by small, independent shops who truly care about crafting a tasty donut. The large chains cannot compete in quality and taste with these small shops. I've been a fan of Kane’s Donuts, located in Saugus, for many years, savoring their fresh donuts and their huge (and scrumptious) Coffee Roll. Kane's is an institution, known across the country for their donuts, and it is deserving of its accolades. Kane’s Donuts was opened in 1955 by Peter and Kay Delios, and now is operated by five of their children. It has expanded in size since its initial opening and you can eat inside or on their outside patio. There is also a parking lot located next to the donut shop though when it's busy, that lot will be full so you have to park on the street. It's a casual spot, an intimate neighborhood place where you'll find plenty of regulars sitting at the tables, sipping coffee and enjoying donuts. If you can't make it to Saugus, there is now a second location, Kane's Handcrafted Donuts, in Boston's Financial District, on the corner of Oliver and High Street inside International Place. Their donuts and other baked goods use quality ingredients, including fresh local eggs, butter & cream from a local dairy, organic honey from a local beekeeper, locally milled flour, real nuts and fresh fruits, Applewood smoked bacon, pure Vermont maple syrup, imported Swiss chocolate and more. The Menu has plenty to offer, with Donuts costing $2 each. You will also find Muffins ($2.75), Cupcakes ($3.85), and Pastries ($2.75). If you want a Breakfast Sandwich, on a croissant, bagel or English muffin, you can get an Egg & Cheese ($3.95) or add Bacon/Sausage ($4.95). They even have Bakery Pizza for $3.00 a slice. These two trays display the various Donut flavors you can find, some which are regularly stocked while others are seasonal or limited editions. Whatever your Donut preference, you'll find a flavor that will appeal to you. They also offer a few Gluten-Free varieties, of which I'll mention more later in this post. These are some of the Cupcakes and other Pastries which are available, and those Cupcakes are quite large. And this is the famous (or maybe infamous) Coffee Roll ($12.95). It is about the size of a hubcap, ready to feed several people (or one ravenous person who might need a doctor afterwards). With a sweet glaze, the coffee roll is fresh and soft, rich with cinnamon. The center of the roll is the best part, loaded with cinnamon, and you might have to fight your family or friends to have it. You can also get a smaller, more individual-sized Coffee roll for only $4.00. 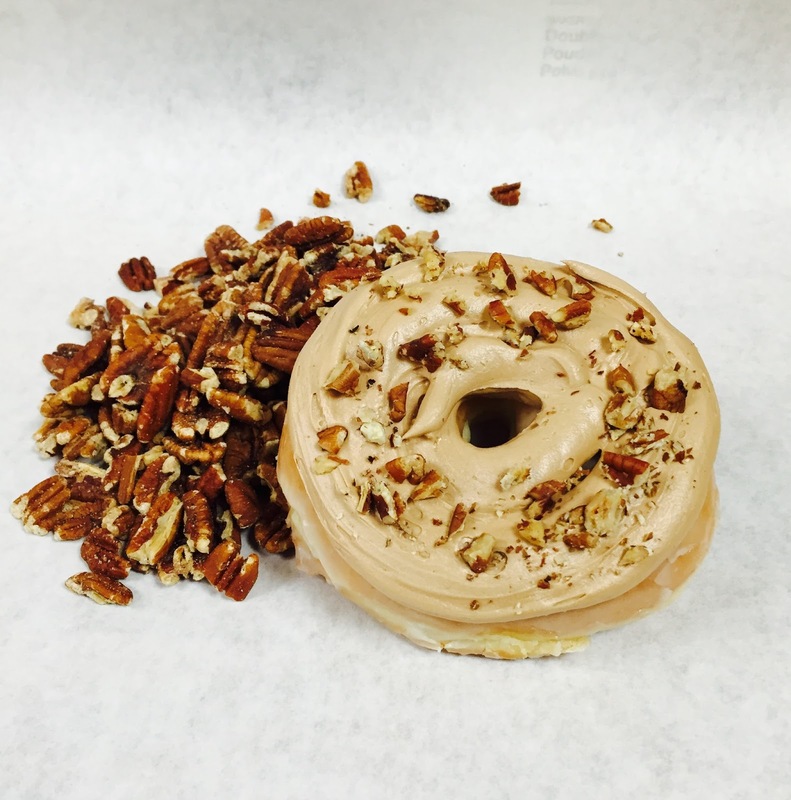 For the month of June, Kane's Donuts is offering three special flavors. From left to right, you have Butter Pecan, Devil’s Food Chocolate Sea Salted Caramel, and Battle Cry Whiskey Glazed. The donuts went on sale yesterday and I was invited for a media visit to check out these new flavors. In addition, I got to try one of their Gluten Free donuts as well. The Butter Pecan Donut is a yeast donut, topped by a creamy frosting and covered with pecan pieces. The donut itself is light and fresh, smeared with a decadent frosting that reminded me of an excellent butter pecan ice cream. The pecans added a nice texture, as well as additional flavor. When you get frosted donuts at the large chains, the frosting is usually hard and rarely soft and gooey. This is not the case with this Butter Pecan, which has a frosting you might find on a freshly made cake. Definitely recommended. The Devil’s Food Chocolate Sea Salted Caramel Donut was absolutely delicious. 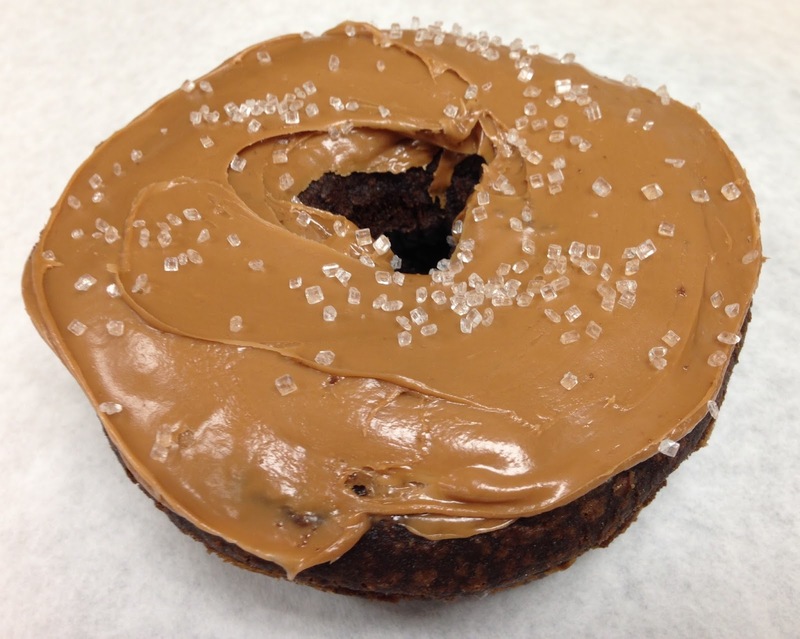 It is a cake donut, with a firm texture and a tasty dark chocolate flavor. This donut also had a creamy frosting with a bright caramel flavor, enhanced by the crunchy salt sprinkled atop the donut. I love the combination of sweet and salty, especially with chocolate, and this donut succeeds well in presenting a hedonistic pleasure. Highly recommended. 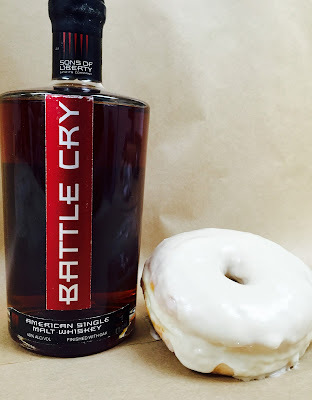 The Battle Cry Whiskey Glazed Donut is a special collaboration between Kane's Donuts and Sons of Liberty Spirits, intended to be a special treat for Father's Day. Located in Rhode Island, Sons of Liberty produces whiskies made from special beers, as well as seasonal whiskies. For this donut, they offered their Battle Cry Whiskey, which begins as a Belgian-style ale. Back in 2014, I tasted their Battle Cry and found it smooth and easy drinking, with a nice complexity of flavors and plenty of spice and a mild sweetness. It's a pleasant sipping whiskey that would also make some tasty cocktails. Kane's boiled down the whiskey, to cook out most of the alcohol, and then blended it with sugar, honey and butter to create a special glaze for one of their yeast donuts. Again, the donut was light and fresh, and the glaze was sweet, though not overly so, with very subtle flavors, and possibly a whisper of whiskey flavor. I would have preferred a stronger whiskey flavor in the donut. With its mild flavors, this donut didn't compare as well to the other two donuts which were more vibrant with flavor. The concept of this donut is appealing but the execution didn't follow through sufficiently. As this was only the donut's first day in the shop, maybe they will work on the recipe to make the whiskey taste more prominent. Finally, I tried one of their Gluten Free Chocolate Coconut Donuts. This is another cake donut but it has a different texture, a softer one, than the Devil's Food donut. It possesses a rich chocolate flavor with plenty of sweet coconut. As a big fan of coconut, I really enjoyed this donut and though it lacks gluten, it certainly doesn't lack any flavor. The texture may be different but that doesn't lessen the quality or taste of the donut, and some people will prefer this softer style. Highly recommended. If you haven't visited Kane's Donuts, you need to make the trip there and sample their delicious donuts or maybe go for one of those massive coffee rolls. The donuts are produced from quality ingredients and taste fresh and delicious. For the month of June, you can check out their three special donuts and then get ready for whatever specials come in July. I need to return there soon too, especially as I want to try their pizza. Maybe I'll see you there.